Peru, apart from its culture, gastronomy and traditions, gives us diverse and great festivities in which not only the Peruvian population participates, but also that of all Latin America and the world. Everyone is invited! During most of the year the calendar is full of different parties, full of color, music and joy that flood from the north to the south of the country. This festival in honor of the Virgen de la Candelaria , takes place in the city of Puno during the first half of February of each year. It is one of the largest cultural, musical and dance manifestations of Peru, being one of the most important religious festivals in South America and named as the Cultural Patrimony of the country. 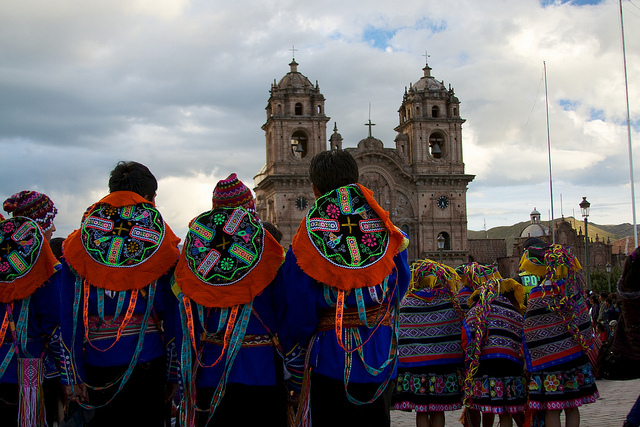 This commemoration of the patron saint of Puno summons a large number of people, who have the possibility to see more than 150 dance and music groups native to the area. There are approximately 40,000 dancers and 5,000 musicians who give life to this celebration full of symbols typical of the Quechua, Aymara and Andean highland people. A few days before the start of Catholic Lent , this carnival is celebrated throughout Peru, but it has different manifestations in all regions of the country, although the typical magical joy of the Peruvian people remains in common. One of the most characteristic activities of this festival consists of planting a tree loaded with gifts around which it is danced until it is knocked down with the cuts of an ax or a machete. If you are traveling through Peru in those days, we recommend you to be careful and alert, as it is very common for water to be thrown at passers-by, in the form of mischief. This carnival is accompanied by various games with painting and flour, folk dances and Christian rites. This festival celebrates the abundance of grapes and the same wine in the Ica region. The celebration already takes more than 30 versions and takes place between March 8 and 18 of each year. This festival includes fairs, music festivals, folk dances and float parades, where commercial firms, colleges and universities participate. But the great attraction is the election and the coronation of the Harvest Queen, who performs the treading of the grape as the final act with her cut, but not everything in Ica is wine, the attendees, who are more international each year, they can also enjoy various liquors such as pisco and aguardiente. They are celebrated on July 28 and 29 to remember the Declaration of Independence of Peru signed on July 28, 1821 by the Liberator José de San Martín. The celebrations start on the night of the 27th where serenades of folkloric and Creole music are sung in squares and parks throughout the country and follow the dawn of the 28th, where the day is received with 21 cannon shots prior to the flag raising ceremony. That same day at 8:00 o’clock the Ecumenical Te Deum takes place in the Cathedral of Lima, presided over by the Archbishop of Lima and attended by the President of the Republic and his Ministers of State. The celebrations culminate on the 29th with the Great Military stop, a ceremony in which the armed forces and the National Police and a large part of the civil society of Peru participate. This spring celebration is held in Trujillo between the final days of September and the first days of October of each year. The city of eternal spring is responsible for hosting thousands of attendees to the festival that dazzles with colorful parades of allegorical cars alluding to the most beautiful season of the year, who compete for the “Best Allegorical Chariot” award given by the Club de Lions of Trujillo. Since 1950, this festival has been growing and crossing borders, as thousands of tourists from all over the world fill the streets of Trujillo to witness this great party that culminates with the coronation of the Queen of Spring.